August-September marks the 100th birthday of ‘the greatest urban legend of the 20th century’ – The Angels of Mons. The inspiring tale of desperate Tommies saved from annihilation by the Kaiser’s troops via the intervention of shining angel warriors – led by St George wielding a flaming sword – was believed by millions during the Great War. The Angels of Mons went on to inspire countless newspaper stories, books – including my own account of the legend, published in 2004 – films and even sheet music. This and other legends of the 1914-18 war are set to be re-told and debated once again as the centenary of the battle of Mons approaches. In August the Belgian city will play host to an international event to commemorate the outbreak of WW1 at the war cemetery and nearby battlefield. Rumours about phantom bowmen, saints and angels protecting Allied troops spread to the Home Front after author Arthur Machen published a short story in the London Evening News in September 1914. I will discuss the respective roles played by Machen and his contemporary Edgar Rice Burroughs in a series of talks at conferences and literary festivals to mark the centenary of the battle and the legend it spawned. This will include some new revelations about the possible inspiration for the story and those who claimed to have seen the ‘angels’ and bowmen of Mons. In June I will be presenting my latest research on the Mons legend in Prague at the annual conference of the International Society for Contemporary Legend Research (ISCLR). Scholars of urban and ‘contemporary legend’ from across the globe will be sharing the latest research in the field at this wonderful six-day event in the capital of the Czech Republic. 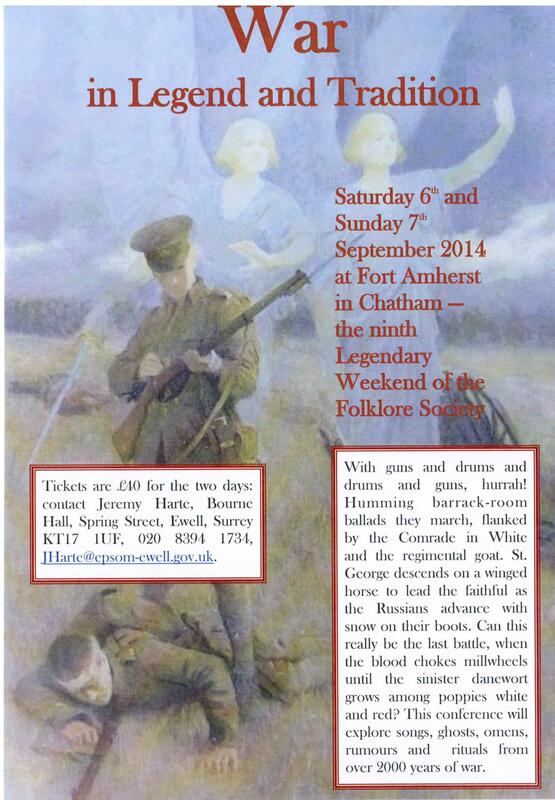 Nearer the anniversary I will be speaking about The Angels of Mons and other legends of the war at The Folklore Society‘s legendary weekend at Chatham, Kent, on 6-7 September. With the timely theme of ‘War in Legend and Tradition‘ this conference will explore songs, ghosts, omens, rumours and rituals from the last two millennia of conflict. ‘War in Legend and Tradition’ will be held in the Napoleonic-era Fort Armherst and organiser Jeremy Harte is keen to hear from anyone who can contribute to the military theme – folklorists, veterans, storytellers, re-enactors, military historians or ‘poor bloody infantry’. For more details contact Jeremy via the Folklore Society website here. And later in the year I will present an illustrated lecture on the Mons legend at the Off The Shelf literature festival in my home city of Sheffield before taking the angels of Mons on tour. This entry was posted in Uncategorized and tagged Angel of Mons, angel warriors, angels of mons, Arthur Machen, battle of Mons, Czech Republic, Edgar Rice Burroughs, Folklore Society, Fort Armherst, International Society for Contemporary Legend Research, ISCLR, Jeremy Harte, London Evening News, Mons, Prague, The Bowmen, War in legend and tradition. Bookmark the permalink.